Help us from the ground up with our "Operation Save the Soffits" Campaign. Each Brick has a $250.00 Value. We still have a lot of bricks to fill, this year our goal is to fill as many as we can. We have many fundraisers set and much of our funds earmarked toward this project. 1) 100% of our Gallery 264 Proceeds will go toward Restoration. So every time you shop the Gallery the artist commission goes to restoration account. 2) 10% of all our base Membership Proceeds, Quarterly 10% of our membership funds will be put into the restoration funds. Plus the Sustaining & Century surplus will go directly to the restoration account. 3) 100% of Quarterly Gift Basket Raffle Proceeds will go directly into the restoration account. 4) 100% of Art in Bloom Proceeds (Vendor Fees & Raffle) will go directly to the restoration account. ​5) 20% of all rental proceeds of quarterly total will be transferred to restoration account. 6) 10% of Teacher's Fee proceeds of quarterly total will be transferred to restoration account. 7) 100% of Restitution Proceeds to be deposited into Restoration account. 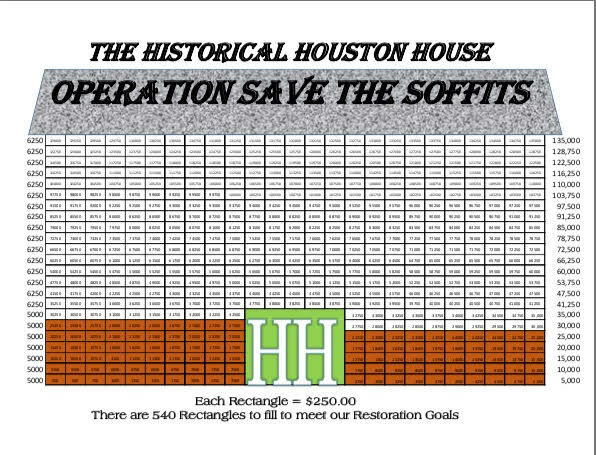 8) 100% Proceeds from Fill in a Brick "Operation Save the Soffits" Campaign. Click on Logo to donate directly to the Houston House Restoration Fund Housed at the Union County Foundation. Or Print out form to right and send check to the Union County Foundation, put Houston House Restoration in the memo area of your check. All Donations to be made directly to the Union County Foundation. If you would like to be a part of this effort. Name Listed on Website, 1- Lifetime Family Membership, 1 - 8 Hour House Rental, Framed Certificate, & Name of Engraved Plague. Honor Our Donors! Thank you for you Donation! One Brick at a time and one name at a time!